The palms and pines that line the winding route down into St Jean Cap Ferrat culminate with the animations of the port, where pretty restaurants, beret-clad artists and contemporary sculpture line the yacht-filled harbour. One of the French Riviera's most sought after destinations and one of the 'golden triangle' which also includes Beaulieu and Villefranche, St Jean became fashionable at the turn of the 20th century, with King Leopold of Belgium and Beatrice Ephrussi de Rothschild building fine estates here. Since then St Jean has hosted the glitterati of Europe, including Elizabeth Taylor, David Niven, Winston Churchill and Somerset Maugham. A short walk from St Jean, privately tucked away, is Villa Cap Ferrat. 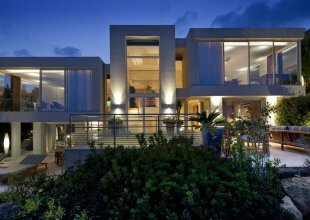 An architectural marvel of glass and curvaceous terraces, Villa Cap Ferrat comprises over 1250 sqm. of modernist internal space spread over five levels - each floor accessed via a grand spiral staircase, or a glass elevator, sweeping past a 25m Banksy mural. Stepping out on the top floor, the master bedroom has spectacular, sweeping sea views, taking in St Jean harbour. An en suite bathroom has bath and rain shower (from mist to torrential), and a walk-in wardrobe, all warmed by an open fire. Two first floor bedrooms also perfectly capture the sea view, with full-length windows, fossil granite bathrooms and full entertainment systems including an iPod dock. On the ground floor, in addition to a fourth bedroom, a surround-sound cinema has a comprehensive library of films and a kitchen for drinks, snacks and popcorn. A gymnasium has a multi-exercise lifecycle, free weights, a black granite hammam and shower. Terraces are perfect for entertaining, with dining tables seating up to 16 guests for lunch. At dinner, a candlelit wall flickers as the sun sets, and as the stars begin to twinkle, outdoor music can transform the space into an impromptu nightspot. In the grounds, a wooden footbridge leads to a two-bedroom guest house, fully contained with kitchen facilities and private terrace.